I was unaware of pineapple pachadi till the time I came to US. It was from Seema Chechi our friend in New Jersey I learned that even pineapple can be used to make pachadi. 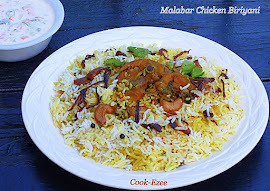 I'm sure it is not a Malabar item, because I never had it for any marriage sadya's in Kannur. Seema Chechi is from Ernakulam and Palghat and her recipes are different from mine, but must say she is a master in veggie food. The day I landed in US for the first time we stayed at Seema chechi's home and I remember having this pachadi from there. She also added some chopped grapes I guess and it tasted really awesome. I have added raisins instead of grapes since I did not have any grapes at home. 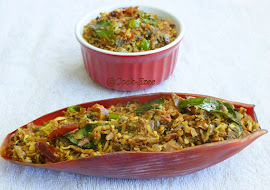 I just love Seema chechi's food and we used to drive from Maryland to New Jersery on many weekends during my first pregnancy when I used to feel sick of my own food Those were good old days, thanks a lot Seema Chechi for this wonderful recipe. Enjoy!!!!!! 2. Grind coconut and mustard seed to a fine paste and add to the cooked pineapple. 3. With a spoon beat the yogurt just to remove the lumps if any and add to the pineapple. Stir everything gently and check for the salt and sourness. 4. Heat the oil in another pan, crackle the mustard seeds, add raisins, curry leaves, urad daal, dried red chillies and saute for a min. Add this to the pachadi. Hint:- while cooking the pineapple make sure to add very little water. Pachadi should be thick, not watery. This tastes better after 3-4 hours.